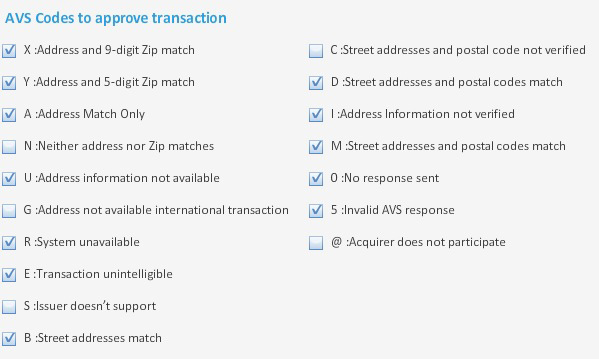 Above are all the possible responses for credit card address verification, in a screenshot from the CenPOS merchant parameter manager, where administrators can set rules and automatic alerts to mitigate fraud risk. Zip code and CVV each have additional response options. Ever wondered what the possible responses when a merchant does a credit card address check? For card not present transactions, performing fraud checks can mean the difference between lost disputes and managed risk. Payment gateways vary widely in the response data returned to a merchant. For example, PASS, FAIL, and UNCHECKED, provide little information for a merchant to make an educated decision about whether to approve a transaction. What responses are possible? What depth of information is available to review? Can merchant automatically decline a transaction, but allow a supervisor to override? Can merchant automatically send real time alerts to management of potential risky transactions? Are there other fraud tools that can be used as part of the transaction review? What services cost extra, and what are standard? Equally important is the ability to automate activating different tools for different situations. For example, if a merchant switches between card present and swiped transactions. What is the payment flow for card absent transactions? This entry was posted in CenPOS, fraud protection, knowledege base and tagged card not present, credit card fraud, payment gateway by Christine Speedy. Bookmark the permalink.